Earlier this week, the United States Senate passed The Opioid Crisis Response Act of 2018. The bill is focused on battling the opioid epidemic and was almost unanimously passed with a 99-1 vote. According to the Centers for Disease Control and Prevention, overdose deaths killed an estimated 72,000 Americans in 2017 and the total estimated "economic burden" of prescription opioid misuse alone in the United States is $78.5 billion a year, including the costs of healthcare, lost productivity, addiction treatment, and criminal justice involvement. The bill provides $3.8 billion in funding. The bill contains a large number of different proposals from five Senate committees. One of those proposals requires prescribers to electronically prescribe controlled substance prescriptions for Medicare Part-D covered medications. The Centers for Medicare and Medicaid Services (CMS) would be responsible for specifying a list of exceptions and outlining the penalties for failing to comply with the e-prescribing requirement. This bill comes after similar legislation passed through the House in June. Senate Health, Education, Labor and Pensions Committee Chairman, Lamar Alexander, R-Tennessee, said he is working to combine the bills "into an even stronger law to fight the nation’s worst public health crisis, and there is a bipartisan sense of urgency to send the bill to the President quickly." A combined version is expected to reach President Donald Trump’s desk for signing by early October. 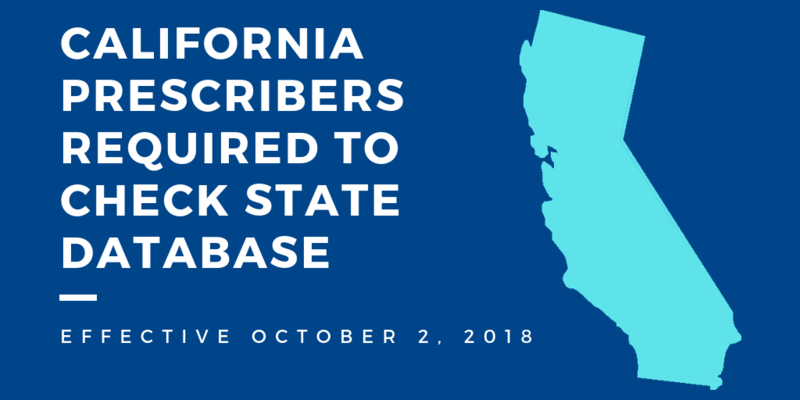 Starting October 2, 2018, prescribers in California will be required to check the state’s prescription monitoring database, Controlled Substance Utilization Review and Evaluation System (CURES), before prescribing Schedule II, III, or IV drugs. California is one of 39 states that mandate prescribers to check prescription monitoring databases in an effort to combat the opioid epidemic. By checking a database before prescribing, prescribers can identify “doctor shoppers” who go from doctor to doctor to obtain multiple prescriptions. Prescribers will now be required to check CURES if it is the first time prescribing the scheduled drug for the patient or if it has been four months since the last time they checked the database for the patient. The check must be completed no earlier than 24 hours or the previous business day prior to the prescribing, ordering, administering or furnishing of a controlled substance to the patient. All prescribers who were authorized to prescribe or dispense Schedule II-IV controlled substances were originally required to just register to use CURES by July 1, 2016. The requirement to check the database was to start six months after the state certified the database was ready. The California Department of Justice (DOJ) certified CURES was ready for statewide use on April 2, 2018. The Medical Board of California also recommends that prescribers either note in the patient’s chart that they checked the CURES database or print the report and put it in the patient’s file to document that the check was completed. MDToolbox makes it convenient for prescribers to check CURES by providing a link directly to the database from within the prescription writer. The system also automatically makes note that the database was checked for the prescriber. For more information and to request a free trial, see California E-Prescribing or contact us at info@mdtoolbox.com. 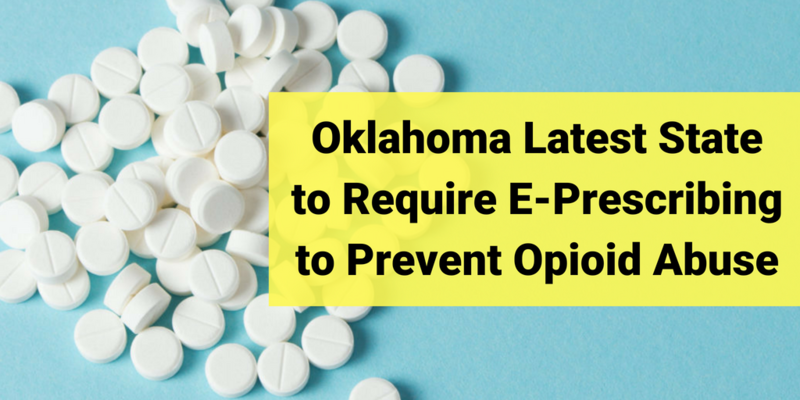 Oklahoma recently became the latest state to enact an e-prescribing law in order to prevent opioid abuse. Governor Mary Fallin signed into law House Bill 29311 which will require prescribers in Oklahoma to electronically prescribe Schedule II through V controlled substances starting January 1, 2020. The bill allows for a few exemptions in certain circumstances such as for veterinarians or prescriptions that are administered through an on-site pharmacy at facilities like nursing homes. It also states that waivers or extensions can be granted through the licensing board. There aren’t any details on what will constitute a waiver or extension at this time though. Other states who offer waivers and extensions will grant them for reasons like a lack of proper technology such as internet or computers. 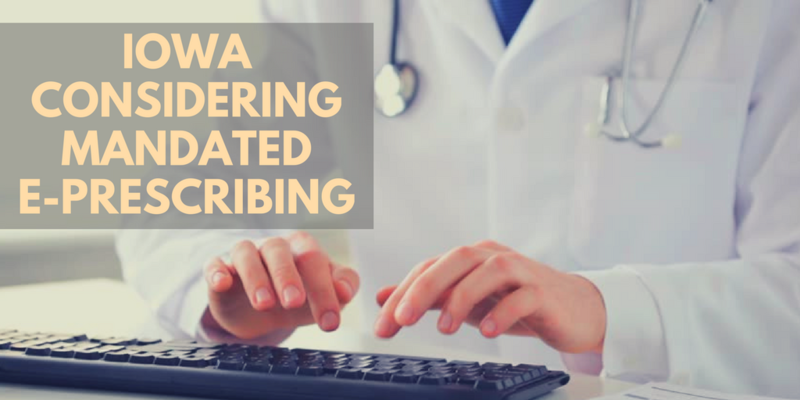 If a prescriber is granted an e-prescribing waiver, they will be required to use official prescription forms provided by the Oklahoma State Bureau of Narcotics and Dangerous Drugs Control. Pharmacists will not be required to verify that a prescription falls under an exception. Currently, only 12% of prescribers in Oklahoma are enabled for EPCS. 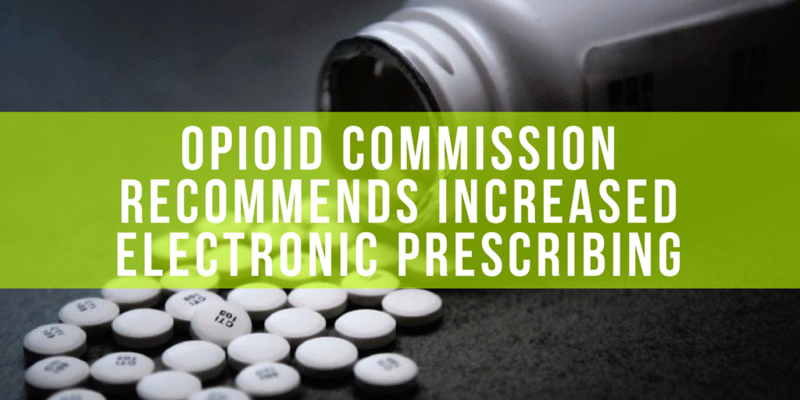 However, 96% of pharmacies are able to receive electronic controlled substance prescriptions. E-Prescribing offers many benefits in addition to preventing forged prescriptions. MDToolbox can help prescribers in Oklahoma, as well as nationwide, start utilizing all of those benefits. See Oklahoma E-Prescribing for more information or to request a free trial to start e-Prescribing today. The policies will apply to all Walmart and Sam’s Club pharmacies in the United States and Puerto Rico. The 7-day limit policy is set to be enforced within the next 60 days. The EPCS requirement will not go into place until January 1, 2020 but it is an important piece since electronic prescriptions prevent fraud and minimize errors. While many states have either already implemented or are in the process of implementing laws to limit opioids and require EPCS, this is the first large pharmacy chain we have seen implement such measures. Some states limit opioid prescriptions to fewer than 7 days in which case they will default to the state law. Walmart also plans to give access to the controlled substance tool, Narxcare, to all pharmacists, provide naloxone recommendations for patients at risk of overdose, and have additional trainings and education on opioid stewardship by the end of this summer. At MDToolbox, we agree that these are all important measures to take in the fight against the opioid epidemic. We continually urge prescribers not to wait for such policies to be enacted and to start e-Prescribing controlled substances as soon as possible. Find out more about EPCS or contact us for a demo to see how easy it is to implement. Electronic prescriptions allow for providers to enter any free-text directions (Sig) they wish, just as if they were writing a paper prescription. The patient directions are one of the most critical parts of a prescription. It’s a huge safety risk if patients do not understand how to use their prescription or if a pharmacist has to try to interpret what the provider means. In a recent study that analyzed 25,000 electronic prescriptions issued by 22,152 community-based prescribers using 501 e-prescribing software applications, it was found that there was a large number of variations in the electronic prescription directions1. The quality of the directions also varied greatly. The study was conducted by Yuze Yang, PharmD, from Surescripts and colleagues, and published online in the Journal of Managed Care & Specialty Pharmacy. Out of the 25,000 e-prescriptions, there were 3,797 unique Sigs concepts identified in the Sig text strings. However, more than half of all patient directions could be classified into just 25 unique Sig concepts. There were large numbers of variation of even what would be considered simple and straightforward directions found. For example, over 800 permutations of words and phrases used to convey "take one tablet by mouth once daily" were identified. The researchers not only looked at the variations, they also analyzed the Sig text strings for quality-related events which were defined as “Sig text content that could impair accurate and unambiguous interpretation by staff at receiving pharmacies.” The biggest quality issue observed was incomplete Sigs. Prescriptions were commonly missing relevant dosages or administration frequency/timing information. They found that more than one in ten prescriptions contained some sort of quality issue. Considering the number of electronic prescriptions that are sent and the not only time-wasting potential but possibly catastrophic results that could come from such quality issues, that figure is way too high. Free-text directions – although free-text directions open it up to possible quality errors, MDToolbox has implemented quality checkers to ensure that free-text directions are not missing any of the information the contributes to many of the quality issues such as “how much” or “how often” the prescription should be used. MDToolbox is also constantly looking for ways like our quality checkers to enhance these areas even more. Part of the way we do this is by conducting usability tests and end-user trainings in order to get feedback from users and ensure users are taking advantage of the available tools. We share a goal with Surescripts to have zero-error e-prescribing and are continually striving towards this goal. Earlier this week, a bipartisan group of U.S. 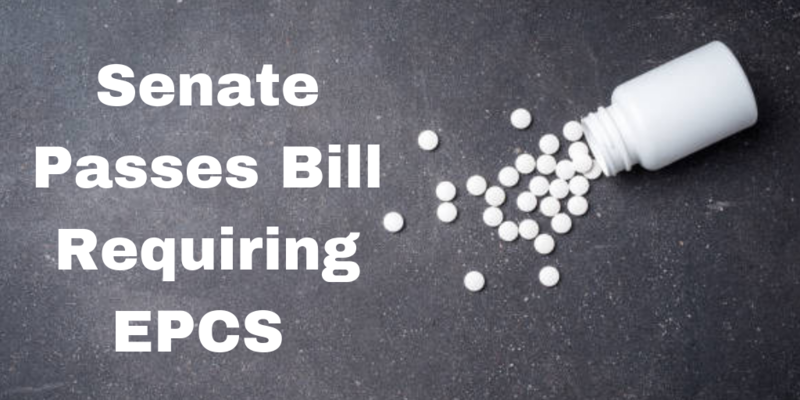 Senators introduced the Every Prescription Conveyed Securely (EPCS) Act. Under the act, all controlled substance prescriptions under Medicare would have to be sent electronically. The aim of the bill is to combat the opioid epidemic by preventing fraudulent prescriptions and doctor shopping. The legislation was introduced by four senators: Elizabeth Warren, D-Massachusetts; Michael Bennet, D-Colorado; Dean Heller, R-Nevada, and Pat Toomey, R-Pennsylvania. As we wrote about previously, companion legislation was introduced in the House of Representatives in July by Congressman Markwayne Mullin (R-OK) and Congresswoman Katherine Clark (D-MA). House bill 35281 has a lot of bipartisan support with 21 cosponsoring representatives including 11 Republicans and 10 Democrats. A Department of Justice report recently released found that misused prescription opioids are often obtained illegally using forged or altered prescriptions and by consulting multiple doctors. It was also found that most prescription fraud remains undetected. “An epidemic of this magnitude requires us to address all aspects of the problem, starting with how providers prescribe opioids,” Bennet said in the statement. "This bipartisan legislation would expand a critical tool to track the use of opioids, ultimately reducing overdoses and saving lives." The bill is proposed to go into effect in 2020 and does allow for some exceptions. These include prescriptions generated and dispensed by the same entity, economic hardship, technological limitations and other exceptional circumstances. At MDToolbox, we strongly encourage all providers to not wait for legislation and to take advantage of the benefits of e-Prescribing controlled substances as soon as possible. It not only prevents fraud but makes things easier for prescribers as well. We are happy to answer any questions you may have about getting started with EPCS and offer a free 30 day trial so that you can see how quick and easy it is. Iowa is the latest state to consider legislation that would require electronic prescribing. The Iowa Board of Pharmacy suggested Senate Study Bill 30741 which would require all prescriptions to be sent electronically. Like several other states with similar enacted and proposed legislation, lawmakers in Iowa hope to curb the opioid epidemic with this bill. Executive director of the Iowa Board of Pharmacy, Andrew Funk, informed senators that currently 65% of Iowa prescriptions for non-addictive drugs are sent electronically, but only 9% of prescriptions for addictive drugs are electronic. This leaves a lot of room for fraudulent prescriptions. Iowa Senator Tom Greene, a former pharmacist, is all too familiar with forged paper prescriptions. "A patient presented me with a prescription for sleeping medication-a controlled substance," said Greene. "And the doctor had ordered ten tablets. Well, the patient changed the one-zero to a four-zero. There are cases like that out there, and again electronic prescribing and the electronic transmission of that information is very accurate." Lawmakers hope that in addition to preventing phony prescriptions, it would also help with mistakes caused by handwritten prescriptions. Prescriptions sent electronically eliminate the possibilities for patients to alter them, as well as remove the potential for pharmacists to misinterpret illegible prescriptions. As the bill is written now, it would begin July 1, 2019. Some lobbyists, however, feel that this is too soon especially for rural hospitals and physicians. They are pushing for the date to moved to July 1, 2020. Senator Greene and two other senators on the subcommittee were said to informally agree to a compromise of January 1, 2020. One of the great things about our stand-alone web-based e-Prescribing products is that there is not a lot of setup needed. As long as a prescriber has a device that can access the internet (computer, tablet, or phone), they can send their prescriptions electronically. While sending controlled substances electronically does require a 2nd device to electronically sign the prescription, it is as simple as using a phone or key fob. 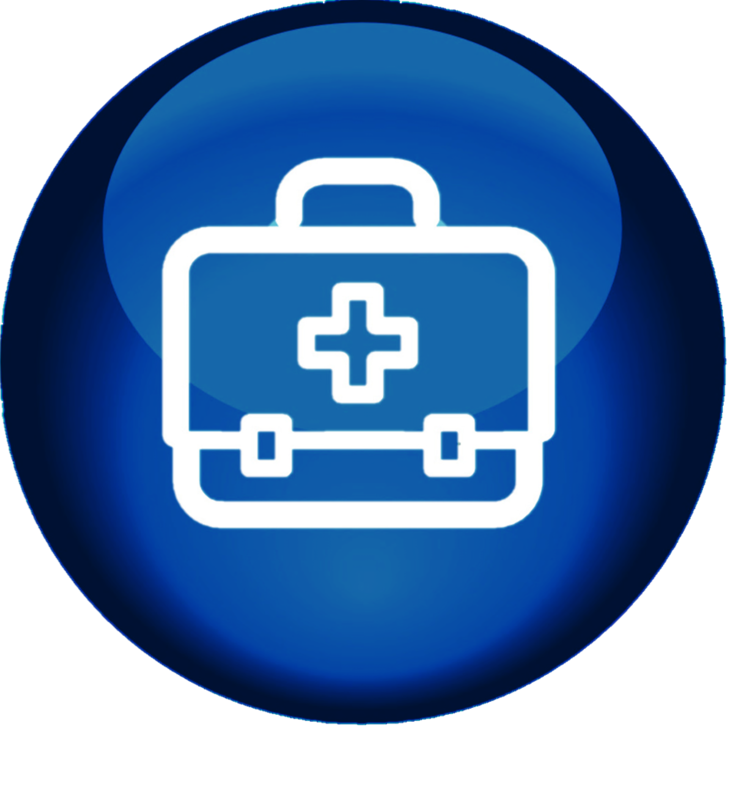 Most prescribers can get setup and start e-Prescribing with MDToolbox in just a matter of minutes. There is no need to stress about putting complex systems in place or wait until the deadline. To see how quick and easy it is, sign up for a free trial or request a demo here. Last week, Arizona Governor Doug Ducey called a special legislative session to pass the Arizona Opioid Epidemic Act1. In record speed, the Arizona Legislature voted unanimously to approve it and Ducey signed it into law on Friday. The act is aimed at combating the opioid epidemic in Arizona, where in just the last 6 months there have been more than 800 opioid-related deaths. The focus of the act is to reduce opioid misuse, promote safe prescribing and dispensing, and improve access to treatment. And limiting the first-fill of an opioid prescription to five days for all opioid naïve patients and limiting dosage levels to align with federal prescribing guidelines. 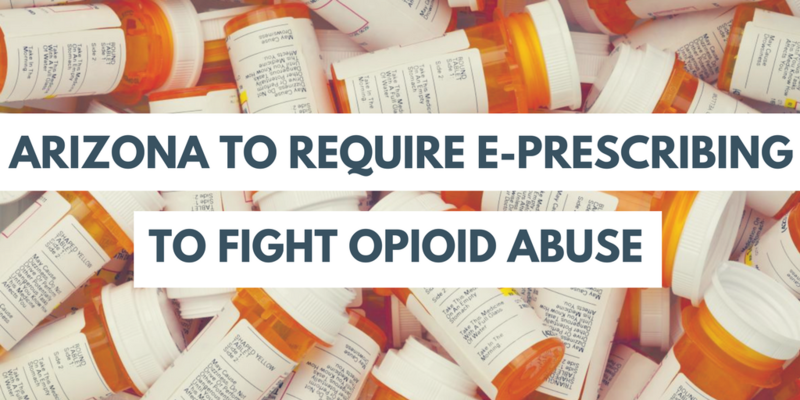 These proposals contain important exemptions to protect chronic pain suffers, cancer, trauma or burn patients, hospice or end-of-life patients, and those receiving medication assisted treatment for substance use disorder. The e-Prescribing requirement will begin January 1, 2019 and mandates schedule II controlled substances must be sent electronically. There is some concern that those in rural areas do not have the necessary technology for e-Prescribing. Therefore, the act gives those providers additional time and outlines that e-Prescribing will not be mandated until July 1, 2019 for counties with less than 150,000. It also allows for the Board of Pharmacy to grant waivers to prescribers with a lack of broadband Internet access or other hardships. At MDToolbox, we urge providers not to wait until the mandate and to e-Prescribe all prescriptions. In addition to preventing forged prescriptions and helping combat opioid abuse, e-Prescribing provides many other benefits for providers and patients. Contact us to get started with a free trial today. As 2017 comes to a close, the deadline for providers to avoid a Medicare penalty in 2019 is approaching and the 2018 reporting periods are about to begin. The Centers for Medicare & Medicaid Services (CMS) has designed the Quality Payment Program (QPP) with two tracks clinicians can take under the Medicare Access and CHIP Reauthorization Act of 2015 (MACRA) - Advanced Alternative Payment Models (APMs) or Merit-based Incentive Payment System (MIPS). As we mentioned at the beginning of this year, the well-known Meaningful Use program has been added as a part of MIPS. There are four components to MIPS: Quality, Improvement Activities, Advancing Care Information (ACI), and Cost. Meaningful Use is part of the ACI component. Providers have until March 31, 2018 to send in their data for 2017 which will increase, decrease, or keep their 2019 Medicare payments the same. The reporting period for 2018 starts January 1, 2018. CMS is taking a gradual approach to implementing the program so the requirements for each year differ. Test – submit a minimum of one quality measure, one improvement activity, or the four required ACI measures and avoid a negative payment adjustment. Partial participation – Submit at least 90 days of 2017 data for more than one quality measure, OR more than one improvement activity, OR more than the four required ACI measures and avoid a negative payment adjustment and possibly receive a positive payment adjustment. Full participation - Submit at least 90 days of data for all required quality measures, AND all required improvement activities, AND all four required ACI measures and earn a positive payment adjustment. Advanced Alternative Payment Model - receive 25% of Medicare payments or see 20% of Medicare patients through an Advanced APM in 2017, and earn a 5% incentive payment in 2019.
o Report all required Improvement Activities. o Meet the Advancing Care Information base score and submit 1 Quality measure that meets data completeness. o Meet the Advancing Care Information base score, by reporting the 5 base measures, and submit one medium-weighted Improvement Activity. o Submit 6 Quality measures that meet data completeness criteria. There are only a couple days left in 2017 to make sure you have at least met the requirements for the “Test” option to avoid the penalty in 2019. It’s also important to note that 2018 requires 12 months of reporting for Quality and Cost measures meaning that reporting period is also starting in just a couple days. It’s vital to make sure you are using a product or combination of products that are certified. MDToolbox was one of the only stand-alone e-Prescribing vendors to certify on the 2015 edition CEHRT requirements earlier this year. We are certified for e-Prescribing and Patient Education and are able to integrate with many other products to meet all of the requirements. 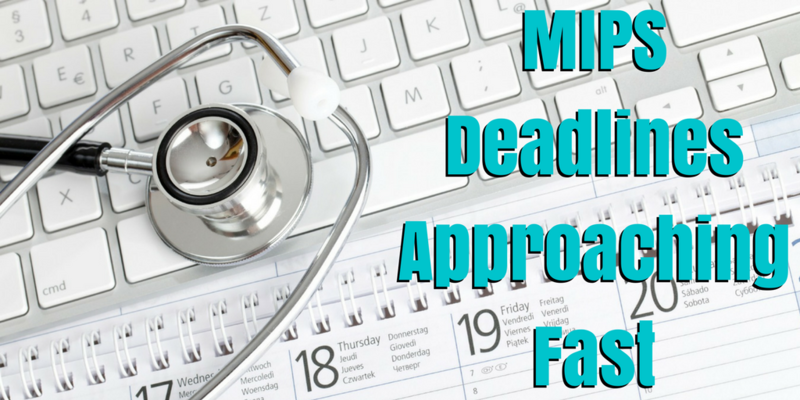 Contact us for more info on how we can help you meet the MIPS requirements. After the President’s declaration, the President’s Commission on Combating Drug Addiction and the Opioid Crisis issued its final report1. In the Chairman’s letter written by Governor Chris Christie, he points out that 175 Americans are dying a day from this epidemic. The 131-page report goes on to include more than 50 recommendations. One of the most prudent recommendations is that the Office of National Drug Control Policy (ONDCP) and the DEA increase electronic prescribing to prevent diversion and forgery. 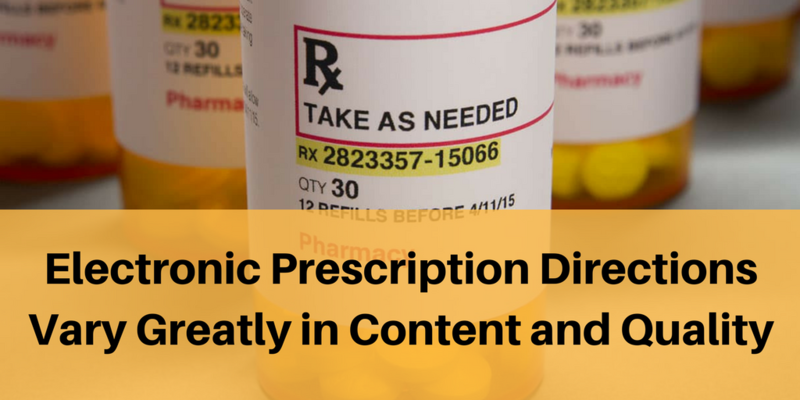 They also recommend that the DEA revise the Interim Final Rule which lays out the requirements for electronically prescribing controlled substances in order to make registration and using EPCS easier. Other recommendations include mandatory PDMP checks, the creation of a Department of Justice-led data-sharing hub, and integrated PDMP data in EHRs. The report suggests passing the Prescription Drug Monitoring (PDMP) Act of 2017 which mandates using PDMPs in states that receive federal funding. This Act also directs the Department of Justice (DOJ) to fund the establishment and maintenance of a data-sharing hub so information could be shared across states. The Commission points out that many providers resist using PDMPs because they don’t integrate well into EHRs, so they believe improving these integrations is necessary to increase effectiveness. While these are great strides in the right direction, there is still a huge issue at hand. Trump did not mention any specific actions the administration will take or how they will be funded. With only declaring it a national public health emergency as opposed to a national emergency, there is not much more funding available. 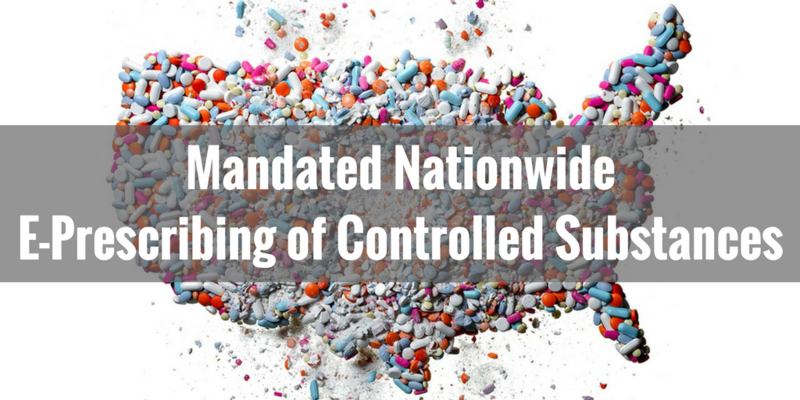 The commission’s report urges Congress and the Administration to block grant federal funding for opioid-related and SUD-related activities to the states. However, the report does not address the amount of funding needed for their recommendations.